“The area in and around Superior is beautiful” and primed for outdoor tourism, says the Superior town attorney, Steve Cooper. Mine opponents agree. Former San Carlos Apache Tribal Chairman Wendsler Nosie said he felt sick when he heard what legislators did last week. Members of Congress — including Sen. John McCain, R-Ariz. — inserted into the National Defense Authorization Act a controversial land-swap measure that would privatize national forest land sacred to Western Apache tribes. More than a dozen versions of the land-swap bill have failed to pass Congress since 2005. But now the U.S. Senate is expected to make a decision on the defense spending bill by late Thursday. After almost a decade of fighting the land swap, Nosie said he couldn't believe it had been tucked into the must-pass defense spending act. "I was questioning, 'Why isn’t anybody listening? Why are McCain and these guys allowed to do what they’re doing?'" he said. The 2,400-acre land parcel near Superior, Ariz., sits atop a massive copper deposit. Foreign mining company Resolution Copper Mining wants to establish a mine there. But the parcel also contains the Oak Flat Campground, an area dotted with petroglyphs and historic and prehistoric sites, conservationists say. Centuries-old oak trees, Manzanita shrubs and other vegetation dominate the rocky landscape. The site is surrounded by canyons where streams flow and natural pools form in the rainy season. "I think any religious people would be outraged," Nosie said in a Wednesday interview. "The issue of it being a sacred site has never come to the forefront. That needed to be discussed." Last year, the San Carlos Apache Tribe, Pascua Yaqui Tribe and Tohono O'odham Nation were among 20 Native American groups who sent a letter to Congressional leaders, protesting the land-swap bill. They argued it tramples on the religious rights of indigenous people. Nosie said it continues a pattern of "killing the identity of native people." Opponents to the land-swap point out that the mine project could be undertaken without privatizing the land, which would ensure it would receive thorough oversight from federal agencies. Pushing a land-swap through Congress is not the only option for the mining company to acquire the land, opponents say. "Rio Tinto has yet to articulate any credible reason why a congressional land exchange is needed, versus the normal administrative processes," states the 2013 letter from the Inter-Tribal Council of Arizona to Congress. Administrative land exchanges are much more common than legislative land exchanges, says a 2010 policy brief from the University of Montana. Administrative exchanges require the U.S. Forest Service or Bureau of Land Management determine that privatizing the land is in the public interest, but a legislative land exchange gives that discretion to Congress. Supporters in Congress say the legislation will bring desperately needed jobs to the struggling mining town of Superior, 100 miles north of Tucson. Town residents are divided, with many saying the jobs are well worth the sacrifice of the outdoor recreation area to the East of the town. The mine is expected to bring 1,400 direct jobs to the area and generate $61 billion over the life of the mine. A spokesman for Resolution Copper, jointly owned by two foreign mining giants, said this week the company would not comment on the land exchange until the Senate votes on it. The San Carlos Apache Tribe says its spiritual beings live within the Oak Flat, Gaan Canyon and Queen Creek area. "Oak Flat is where the creator, God, touched the earth for us. These are our ancestral home places," Nosie said. The Apache collect medicinal plants and acorns there, and conduct ceremonies including the "sunrise ceremony," honoring girls entering womanhood, Nosie said. The mining company has acknowledged that Oak Flat will be damaged by the proposed mine due to its use of block-cave mining. This method of mining removes a mountain of rock from underground, resulting in major subsidence, or collapse, of the land above. Resolution Copper estimates a two-mile wide crater will form at Oak Flat due to the mining. Opponents — including the Concerned Citizens and Retired Miners Coalition in Superior — say the mine could be much less damaging, and still profitable, if a less destructive method of mining were used, such as the cut-and-fill technique historically used in Superior. "We should be able to mine in a way that is less harmful," said Roy Chavez, a former miner and past mayor of Superior. Native American groups and conservationists also worry about the impact to surrounding areas, including the steep cliffs at Apache Leap. They say Gaan Canyon and Queen Creek Canyon could be de-watered by the mining project. 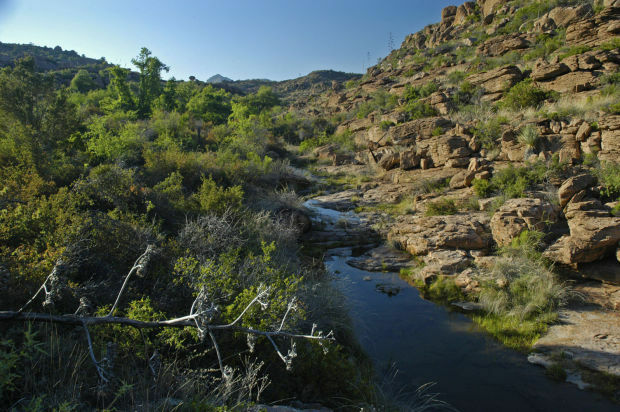 The historical significance of the Oak Flat area hasn't received as much attention as it should have in the land-swap debate, said Scott Wood, heritage program manager for the Tonto National Forest. "People need to understand that in this part of Arizona, there are a lot of significant prehistoric sites," he said. "It’s also an area that was heavily utilized and is very important, in fact sacred, to several tribes, including the Apaches. ... It’s the continuing association that the area has with the Apaches that’s most significant." The controversial bill has been tucked into a "must-pass" national defense spending bill. Star reporter Emily Bregel presents her most important stories of 2014. The land-swap's passage is "devastating," said Wendsler Nosie of the San Carlos Apache Tribe. A video of Arizona Sen. John McCain being chased by protesters on the Navajo Nation is trending on social media.